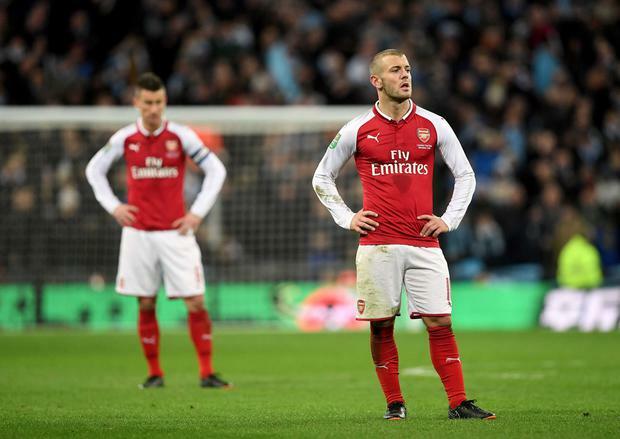 Arsenal manager Arsene Wenger claimed his side were unlucky to lose the Carabao Cup final, despite an emphatic 3-0 win for Man City at Wembley. Thousands of Arsenal fans left Wembley long before the final whistle sounded on a one-sided game, yet Wenger offered up what could be described as an alternative match report as he claimed luck had played a factor in his side's defeat. "When you lose 3-0 of course you have to look at defending better, but I still feel like for large periods we defended well, but we lost concentration sometimes and against good teams you pay for it," he declared. "I felt the game, we had the first good chance, a very easy one that we missed. After that we made a big mistake for their first goal. But we controlled them pretty well in the first half, but they came out in the second half, and we were unlucky because the second goal was offside. But congratulations to Man City, they deserve the win. "You have to accept being criticized when you lose games. But I believe we have to recover quickly. We got to the final, we lost, so now we have to focus on the next Premier League game." "It's not the application that was missed it was the concentration at key periods that was missed. The second goal was a big goal in this game and for me, it was 100 per cent offside. "We analyse all the games in a very mathematical way, we didn't give too many chances away, but we gave away easy chances, and didn't create enough for ourselves." Many Arsenal fans will struggle to agree with Wenger's sentiments, with pressure now certain to mount on the Frenchman's position once again after this latest setback. Meanwhile, Pep Guardiola was keen to hand the credit for his side's victory to his players and the club's owners, as he refused to go up the steps at Wembley to collect his medal. "We're so happy, and a big congratulations to all of Manchester City, and our fans. This trophy is for Manchester City and not for me," he stated. "The first half we were not good, there were a lot of mistakes, in the second half we played with a lot more courage and personality - we were outstanding."